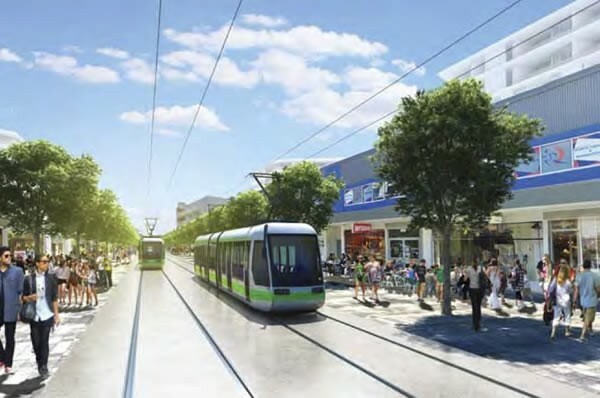 Northbourne Avenue commercial property owners may be divided on the technology, project timing and future routes of light rail but they generally believe it will be good for Canberra, according to Colliers International Research. Colliers International said its ACT Light Rail Survey revealed that commercial property owners believe the major infrastructure project is likely to provide a significant economic boost to local business, employment and encourage further investment in the CBD and ACT region from interstate and overseas. Manager at Colliers International, Matthew Winter, said there was strong consensus about the benefits of the project but some respondents were concerned about the long-term viability of the project given newer technologies such as autonomous (self-drive) cars and bus rapid transit may supersede light rail once construction of the entire network is completed. He said there were varying positions on when the next stages should be introduced and which town centres should be priorities. “Despite not necessarily supporting the proposed technology, half the owners surveyed said now is the right time for light rail to be implemented and indicated the project would serve as a catalyst to reinvigorate tired gateways,” Mr Winter said. Thirty-three per cent of owners indicated the light rail network should expand from the CBD to Woden next, with 30 per cent preferring Canberra Airport. Mr Winter said almost half the owners surveyed felt light rail would have little to no impact on traffic congestion, a fundamental objective of the infrastructure project. “Given Canberra’s perceived growth forecasts and the volume of residential dwellings forecast for Northbourne Avenue, the project, acting as a catalyst for major urban infill, could potentially lead to more traffic along the corridor,” Mr Winter said. But they believed Canberrans would use light rail to commute to and from work, assuming the stops were near office locations and the Government provides viable Park and Ride solutions. Mr Winter said owners believed a lack of information on transit times and fares may cause commuters to choose to take the car, finding it a cheaper and more direct option despite traffic congestion. He said owners believed overwhelmingly that light rail would improve the value of their property. “This seems to support the notion that further amenity and infrastructure along the corridor will have a positive benefit for owners through improved tenant retention, increased accessibility, and provide a solution to the current parking shortage, particularly in areas such as Braddon,” he said. The report revealed that after the announcement of Stage 1 of the project, 50 percent of property owners along the Northbourne Avenue and Flemington Road corridor investigated developing or selling their building for residential purposes. “Given the strategic land release program of the ACT Government along Northbourne Avenue and Flemington Road, many owners noted the likely demand from developers for these opportunities and had investigated possible options,” Mr Winter said. Why was a tram stop not included at Mitchell? Was this an oversight or was it necessary to gain a few minutes on the aggregate trip to “prove” that trams from Gungahlin to City are going to be 10 seconds faster than the current buses? Whatever the reason, the TCCS minister has conceded that a Mitchell stop will be planned for later. This will be one of the many cost increases to come in this project. It’s arguable that light rail will not increase property values any more than would far cheaper bus rapid transit. The main impact of public transport on property values comes from reducing point to point journey times. Trams will be slightly faster than buses on the Flemington Road and Northbourne Avenue sections. On the other hand, replacing 21 bus stops with only 13 tram stops means that many potential passengers would have to spend more time walking to stops. They would spend more time waiting, because trams don’t travel as frequently as buses. Northside residents who live beyond walking distance of tram stops will no longer be able to take a bus direct to Civic, but will instead have a choice of a meandering bus, or a bus to Dickson followed by a walk to a pedestrian crossing, a wait for a green signal, a walk to a tram stop and a wait for the next tram. Here is an interesting link regarding a survey about light rails “success” in the USA. the truth is all Canberrans will pay for the train for many years to come but only a few will get see benefits. That’s a very misleading headline. At least it should have said “some” business people support it. All that will happen is that further residential development along the corridor will perpetuate the apartment glut that has already happened and no property owner along the light rail route is likely to say anything else that the value of their property will increase. And to suggest that further development is somehow going to alleviate parking problems in Braddon is total sophistry. The report says half the owners believe there would be no or little impact on traffic congestion .So, what did the other half say? There it is in a nutshell as to why commercial property owners along Northbourne think its a good idea. Want people to use public transport? You have to meet them halfway. Provide free park and ride along express routes (preferably at local shopping centres, to encourage people to shop at those shops) and people are much more likely to use the system and your patronage will increase. Expecting public transport patronage to increase (ie. existing population, not the newer population that will be created along the corridor) without doing something different to what we have now, don’t go scratching your heads why people are not using public transport.